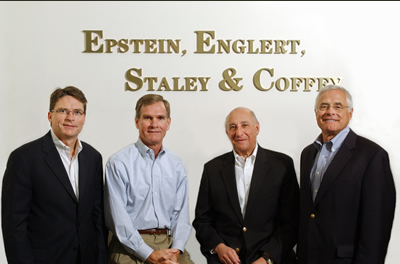 Epstein, Englert, Staley & Coffey is a San Francisco law firm specializing in business, real estate, estate planning and estate/trust administration matters. Within our specialties, we have offered a broad range of transactional and commercial litigation services since 1981. Our attorneys average more than 25 years experience in our practice areas. We encourage you to review our profiles in the Attorney Profiles section of our web site to learn more about each of us and our professional experience. We also encourage you to read the Frequently Asked Questions section of our web site. These questions are intended to provide you with more information about our firm and how we differ from other firms. We operate under a model which assumes that clients want to hire and work with particular attorneys, not large law firms. We offer personalized partner level service by attorneys who know and understand the needs of their clients. The manner in which a transaction, lawsuit or matter is handled is determined solely by the needs of the client, not the need to keep associates busy. Because we understand that different sized transactions and different sized clients may need to be handled in different ways, our philosophy is not "one size fits all." Rather, we call upon the experience of our attorneys to insure that our clients receive the appropriate services to match their specific needs. Our objective is to provide excellent representation without incurring unnecessary expense. We also seek to build long term relationships with our clients, many of whom have been with us more than 20 years. Our real estate clients include commercial landlords and tenants, developers, brokers and design professional firms. Our business clients are primarily privately held companies, including both emerging growth and traditionally closely held companies. The size of the matters handled by our firm varies significantly. While some transactions for our individual and business clients do not necessarily involve large dollar amounts, we also handle transactions such as mergers and acquisitions and real estate transactions with dollar values up to $100,000,000. Our estate planning clients include the owners of closely held businesses as well as medium to very high net worth individuals, and our practice covers the range of their needs in that area as well as estate and trust administration.